More and more schools are using screens in the classroom. While technology is often an asset for many kids, the health issues related to too much screen time, like obesity, are well understood. For parents of kids with ADHD and other learning differences, screens pose additional problems. They can adversely affect brain development, as children spend less time playing or engaging in physical activity. Getting away from screens often improves focus and cognitive ability. Where does this leave parents? If they have a strong relationship with the school, they can address the issue with administration. Often it helps to have allies within the parent community, so joining the local PTA or talking with neighbors can help in the effort. Sometimes, however, all it takes is a discussion with teachers about alternatives to screens that benefit children's health without detracting from the curriculum. In some schools, reducing screen time is a popular initiative. In order to assess the extent of the problem, start by working with teachers to determine how much time children spend using screens in a typical week. Kids should get no more than 1.5 hours of screen time per day, including time at home, according to Dr. Robert Melillo, creator of the Brain Balance Program. Writing, drawing and other hands-on experiences should be the primary ways kids learn in the classroom. 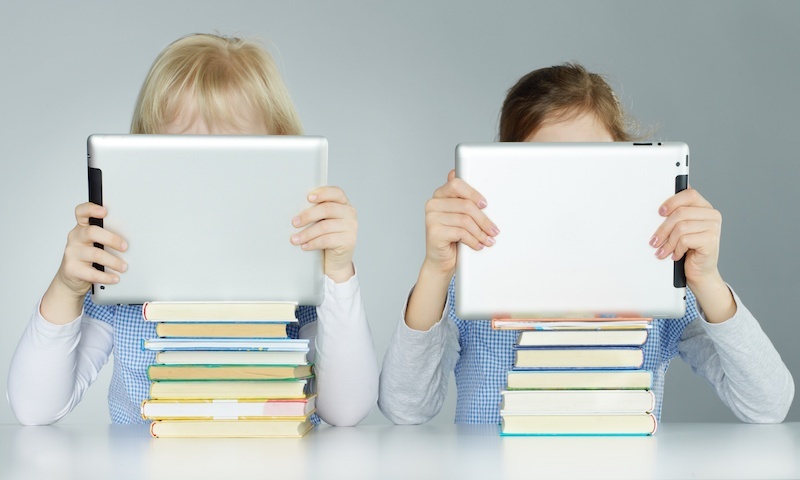 Computers, tablets and e-readers should only be used to enhance and supplement learning and not to replace traditional methods. Having a mixture of materials in the classroom where kids share electronics, instead of spending all day with a device, can limit exposure to screen-based activities. Brainstorm different ways teachers can supplement teaching without the use of electronics. The instructor is probably already accustomed to modifying teaching styles in order to help kids with learning differences. Choosing to do more physical activity to transition kids between subjects or to do indoor games based on learning knowledge and skills instead of watching DVDs can help everyone get out of the habit of turning to technology. When kids spend much of their school day using screens, it makes it hard for parents to limit screen time at home. Educational institutions are slowly curbing the habit of technology and with the assistance of parents can create the right environment that helps kids remain focused on learning.